I had a request from a reader for my low-carb milk recipe. It is featured in both Nourished and Carb Wars; Sugar is the New Fat. Lactose, or milk sugar, tastes less sweet than other forms of sugar, but each 8-ounce serving of milk, including low-fat and non-fat milk, contains the equivalent of 3 teaspoonfuls of table sugar. By using the protein and cream components of real milk and replacing just the sugar, you can make your own delicious, low-carb milk. Stir the whey powder and salt into the cream and mix to form a paste. Add the water and sweetener and whisk until smooth or mix in a blender. Chill until very cold or add ice to the glass. Makes 1 ( 8-ounce ) serving . *I like MRM brand whey powder. If you use a sweetened vanilla whey protein powder, omit or reduce the sweetener. Image: Glass of milk on tablecloth by Janine Chedid. Full Fat Milk, Ice Cold Milk, Low Carb Milk. Bookmark. Would this milk froth for cappuccinos? Anonymous, I don't see why not, but I haven't tried it. Let us know if you find that it does, OK? I just use 12n12 add water to my thickness, then walla'……..milk! How about carnation evaporated milk does it have any sugar or carbs? Minnie, yes, the USDA says evaporated milk has 25.3 grams of carbs per cup from the lactose or milk sugar. Nonfat evaporated milk has 29. Best to avoid these concentrated milks. Yes, Anonymous, anytime milk is called for you can use almond or coconut milk. If the recipe calls for cream, however, you may need to add some fat. You could use coconut cream instead, which is more concentrated than coconut milk and that would probably work as well in most cases. By the way, cream should have very little, if any lactose. The lactose is in the whey. Perhaps if your daughter is highly allergic, she might react to heavy cream, though, if it contains traces of whey. 1/3 cup fairfield filtered milk, I used low fat. mix and enjoy. this tastes awesome. 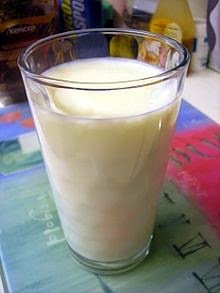 Patricia Bell, low-fat milk has all the sugar of regular milk, often more, because they add more milk powder to keep it from looking thin and blue. You would probably be better off drinking real, whole milk from grass-fed cows than trying to fix low-fat milk by putting the fat they took out back in. My recipe gives you milk that tastes good without sugar.